There aren’t any starships or spirits in The Queue; no mutant alien viruses or Martian colonies, either. And yet, it is speculative fiction, because Basma Abdel Aziz has taken the reality of Egypt’s oppressive security apparatus and its impact on people’s lives and distilled it into a chilling Orwellian/Kafkaesque/Murakamian horror story. After all, the unbreachable, imposing Gate (from which rules and laws are handed down) and the queue that forms from it (of people waiting to enter for permission slips and certifications and signatures) act as invisible magnets, pulling more and more ordinary people into its sphere until an alternate society coalesces around it. At the heart of the story is Yehya, a young man who is shot by Egyptian security forces while witnessing a street protest (called the “Disgraceful Events”) against the increasingly oppressive power of the government. Almost immediately, Yehya runs into trouble- the bullet cannot be extracted, he’s told, unless he gets special permission from the Gate. And so he joins the queue. As time passes, he gets sicker, but he keeps waiting, and the Gate never, ever opens. As a kind of frame for this story, the doctor who refuses to operate on Yehya without official permission begins to feel remorse, and obsessively reads Yehya’s file, which is updated daily by an unseen hand. While the doctor isn’t physically in the queue, he begins to live like he is, caught between wanting to help a seriously ill patient and fearing government repercussions. It is only Yehya’s girlfriend(?) Amani, his friend Nagy, and a friendly journalist named Ehab who question and defy the Gate in the hopes of saving Yehya. You find yourself rooting for them like you would for a helpless insect getting sucked down into a whirlpool. 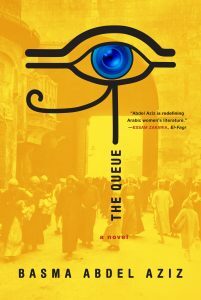 For a fantastic roundable discussion about this book, which goes into much more depth, check out “Let Loose Your Tongue”: A Roundtable on Basma Abdel Aziz’s The Queue at The New Inquiry. We need more novels like this, and I hope that Abdel Aziz keeps writing and reminding us that external oppression fosters internal oppression- we must resist both.